How important is it to know Chain of Responsibility? 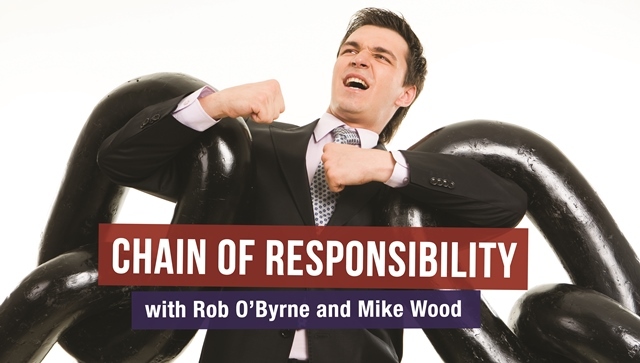 Rob O’Byrne talks with Mike Wood, an expert in the matters of Chain of Responsibility. Rob: Hello everybody, this is Rob O’Byrne from Logistics Bureau and with me today, I’ve managed to pin down Mike Wood from Latus. And why are we talking to Mike Wood today? Well I’ve known Mike for decades now, as we used to work at Dawson Consulting together. It is decades, isn’t it Mike? Mike: It is, thank you for making me feel quite old, Rob. Rob: Mike is actually one of the few people in Australia who I think you can call an expert in the matters surrounding Chain of Responsibility. In fact, Mike and I have done a couple of seminars together on this topic in the past. And I know it’s a constantly changing field, so I thought I’d get Mike on a call and we’ll find out what’s happening in the world of Chain of Responsibility and we can keep people up to date. This is a bit ‘without notice’ Mike but I’m sure you’ll be able to answer this right at the top of your head. Let’s just go through, maybe this will take 5-10 minutes, and we’ll gallop through some sort of fairly basic questions on Chain of Responsibility and you can fill it in. So I suppose we could be cynical about Chain of Responsibility and say, look is it one of these things like sustainability, where a lot of people take it very seriously and some don’t. From the authority’s perspective, are they really taking it seriously? I know some time ago we saw some prosecutions, I haven’t seen a lot recently. Mike: I think it’s fair to say it sort of waxed and waned over the period of its induction. And what we see now is that some people are saying it’s just a fad toward things, it’ll go away, and we’ll just ignore it. But there have been some significant prosecutions because of some significant events which have caused people then to sit up and take notice about what this is really all about. In fact we’ve now seen other aspects coming into Chain of Responsibility as well about how it’s going to work, what it’s going to do. I feel it’s coming back, the prosecutions, jail terms and community service orders. And people are now starting to really take notice that they need to do something, you can’t just ignore this. Rob: About a year ago in Australia, I remember there were a couple of really big cases, was that a bit of a wake-up call do you think for a lot of people? And if we go back historically, it’s always been the poor old truck driver that has copped all of the prosecution’s for when he’s on the road and somehow he is solely to blame, he’s not going to get out of that, that’s why it’s not a get out clause for the driver, but it’s saying that why did the driver act in that particular way and who is responsible right up to managing director and board level? Rob: Are you saying companies now are taking it a lot more seriously? And then that was the attitude a lot companies are getting, saying ‘Let’s do it right, let’s do it in a better way.’ And it’s interesting that we see that, and of course the first thing that lights up is we get these financial offers sitting there and all I can see is the dollar signs rolling through his eyes. But in many, many cases of course, is that if you actually embrace the methodologies of safety and everything else, it actually becomes a cheaper option anyway. And it’s not necessarily a cost, it actually can be a cheaper option. Rob: So I know a lot of people out there, a lot people watching the video or listening to the audio today may think that Chain of Responsibility is all about transport, is that the case? Is it purely about transport? Mike: It sort of is, because the prosecutions can only occur in a road situation. However, the legislation clearly said it’s about anybody who is engaged in the movement of goods. So as a result of that, if you consignor, consignee, receiver, or anything else in the chain, you have some part to play in terms of what those people are going to do. So, if the driver is moving goods on your behalf, did you tell him to do something dodgy, or illegal or whatever? Or did you not take or act properly in terms of making sure he did things in the right way. There are a number of things in there, so it really is a very much broader than just transport and that’s where prosecutions begin. If you’re a manufacturer, or even if you’re just in third party warehousing, you import stuff, it comes into your warehouse, it’s not even your product, you’re just physically holding it on behalf of someone else and they send trucks in to send it out, or you send them out. All of a sudden, you are part of the transport business and it’s probably better to say it’s about the logistics chain rather than the transport chain. Rob: Okay, that’s a good way of putting it. What about if I have outsourced logistics or transport? Surely then am I outsourcing that responsibility as well? So is the logistics company or transport company solely responsible? Mike: Not at all, and in fact the act clearly says that you cannot contract out your liability. Even though you got one of the majors doing your transport, which you would naturally assume that they’re going to do the right thing, do it legally, do it properly; you cannot just assume that’s going to occur. You need to put steps into place to ensure that they are doing the right thing. Of course using the majors is a lot easier, they can actually come back with methodologies and systems. But if you’re using the middle to smaller players, you have the same responsibility with those players and even if you just engaged them directly, they work with your employees and your own vehicles. Who actually owns and runs the vehicles is irrelevant under this legislation. Rob: Does the legislation apply to heavy vehicles? Or is it all freight? Do I have to worry if I’m using parcel carriers? Mike: It depends which state you’re in. If you’re in the eastern states, basically any other state than WA, yes its 4 ½ tons and above. So basically, where the driver’s license changes from a car license to a light rigid and above. But in the west, it’s any vehicle at all, so basically anything that’s carrying goods. Rob: So it could be a motorcycle courier. Mike: It could be a motorcycle. Maybe the pizza delivery guys need to watch out. Rob: That’s interesting. That’s one of the challenges of course that we have in Australia is that we get a slightly different legislation from state to state. So if people aren’t already aware of their responsibilities and the fact that there are some heavy penalties around, maybe this is a good opportunity to shock some people. What sort of penalties are out there? Mike: Okay, there are a couple of things you can get fined for a few thousand dollars for this and a few thousand dollars for that. If you’re really naughty, there’s make that clear is that if you’re really naughty. Rob: What do you have to do to be really naughty in terms of legislation? Mike: Well, it’s about being systemic and persistency. If you make a mistake, and something goes out heavy too long to whatever the case maybe, it’s ‘okay you made a mistake.’ But it’s when that mistake becomes systematic and persistent, that’s where it is. Even if it’s a minor mistake, it’s the systematic side and persistency. Now systematic and persistent in a prosecution, you know there have been fine levels in the order of 15-20 million dollars. And then there’s the big jail term. People have gone to jail. In fact, a transport supervisor in South Australia, just only over a month ago, went to jail for 12 years. Mike: He wasn’t driving the truck, but he was managing the transport business and on his schedule as a supervisor and he was jailed for 12 years. Rob: I think if anyone was not taking chain of responsibility seriously and their liability, you’ve probably just woken them up with a comment like that. Mike: Well the other side of that of course is that you get around to directors of businesses and it meant nothing, it might have been just the warehouses and manufacturer or something like that, they probably won’t get the jail term but there have been between 200-400 hours of community service leveled on these people and that’s can be shocking. Rob: I’m sure that there’s a lot to this and a lot that people need to learn and make sure they’re applying. If businesses are concerned about this legislation and worry that they might fall foul of the law, what would you suggest they do? Mike: The thing to do is have a look at where they and what they are. Now the problem with it is it is an ever changing and there’s a new legislation that pops in on the 1st of January of 2016 about rates. In the1st of January of 2016, there’s a whole bunch of stuff about how people are getting remunerated which is coming in as well, that’s a new bit. If they want to, they can give us a call, drop us an email and we’ll give them general advice on this. And if they really need to go further, they can discuss that as well. I think it’s a matter of giving everyone an understanding of what’s what. Rob: I was going to ask if people have a question could they contact you, I don’t want to bury you in an avalanche of questions but you’re happy to help people out and take questions that they might have? Mike: Many times some people ask a question that has a simple answer and they just have a bit of confusion and didn’t get this is what it is all about, this is how to fix it, this is how to work it out. Rob: Well you might have made rod for your own back here Mike because I’ll put your contact below. But look, I didn’t want it to be an in-depth thing, this is really a quick heads up for people who are not across the legislation, you’re the guy who certainly knows about it and I really appreciate you sharing your thoughts today on the topic. Mike: My pleasure Rob, anytime. Do you have more questions about Chain of Responsibility? You can contact Mike through his email: [email protected]. Great insights Mike. Maybe we can do this again with some more detail for those who need it?